We spent more time working on the studio today. I took a few more iPhone snapshots of the classroom space while we were there. I think we’ll be finished with everything by next week but things are in pretty good shape now. 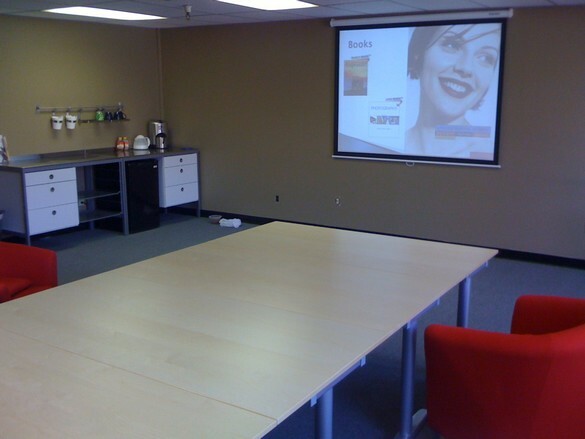 The nearly finished coffee/tea/snack area and our new (larger) video screen. Also notice Luka’s dog bowls on the floor. He made another visit to the studio today. 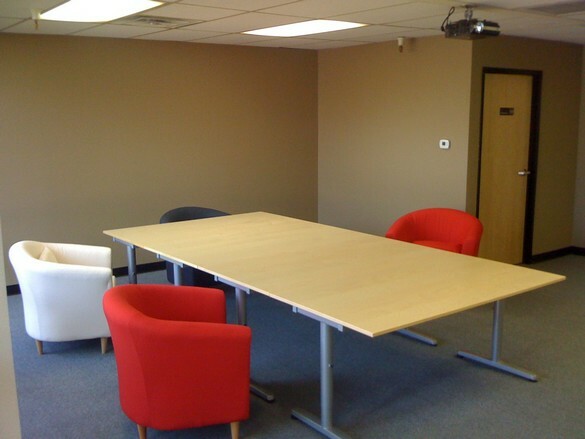 The new tables and chairs that Bill helped build yesterday. We still have nine more chairs on the way, so it’s going to be cozy. We are also going to be hanging some photographs on the walls (of course). If we have room some half height book cases will be installed for that great bookstore/coffee house feeling. The view from the back of the class. The small table at the front is for my laptop. 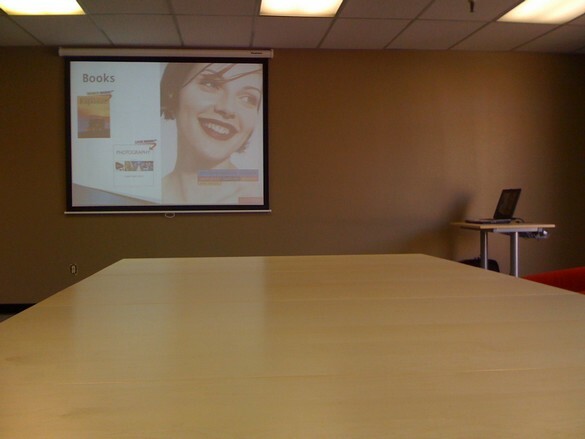 Tomorrow we’ll be installing a white board to the right of the video screen. Another view of the class space. The neat thing about this room is that we designed it to be flexible. For our Photoshop workshops the tables will be arranged differently so students can sit behind the table with a laptop. For the other workshops we will arrange the space in a semi-circle so everyone can share and discuss. Our first class is Tuesday night, I can’t wait! We’re still putting the finishing touches on the studio. Diane spent all day Friday painting the walls and yesterday we picked up the first two truck loads of new furniture for the classroom. We still have more chairs and shelves to pick up and install, but things are getting closer to being finished. Our fist class in the new studio is Tuesday so we’re working hard to be ready. We had some help yesterday from our friends Bill and Daniel. We’re fortunate that Bill has a nice truck because we loaded it to the gills with tables and chairs yesterday. Bill helped build all the tables and chairs and then Daniel showed up to help us with the second half of the day. We really appreciate the help. Here are a couple of iPhone snapshots from the last two days. 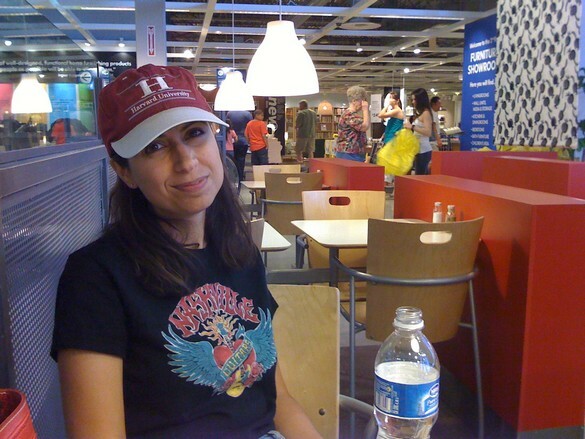 Taking a break at Ikea where we spent a LOT of time yesterday. Our friend Daniel who helped us build the coffee station. The new coffee/tea/water/snack station. 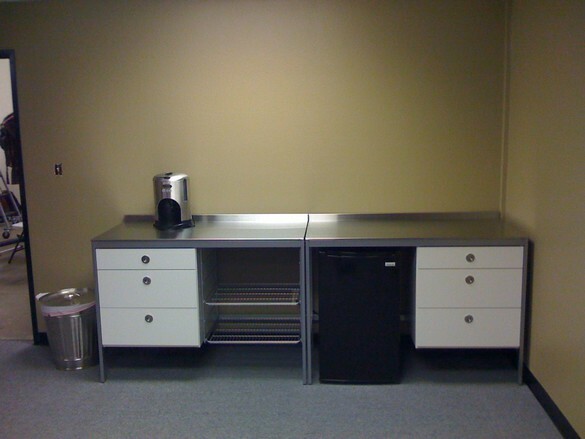 The black thing is a refrigerator and we’ll be installing shelves and cup holders on the wall later this week. I can’t believe I didn’t snap any pictures of the tables and chairs. I guess I was just too busy assembling to remember to take any pictures. I’ll make sure to get some shots today so you can see how the classroom is coming along. I made the last trip to the old studio today. Everything is finally moved out and at home in our new location in Phoenix. Diane and I are both excited to be out of the Tempe studio. We won’t miss the constant sound of jets flying over our heads, the crumbling building, the leaky roof, or the dumpster just outside the front door. I know, I’m making it sound worse than it really was. The old place was a fun location with lots of character and we were happy to have a home in Tempe. Unfortunately the management company didn’t keep the building in good condition and the business park started to go sour soon after we moved in. Two months ago the entire business park was sold and new management took over. But it was too late, the damage had been done and we’d already decided to move to Phoenix. Goodbye Suite 111. Thanks for all the memories. 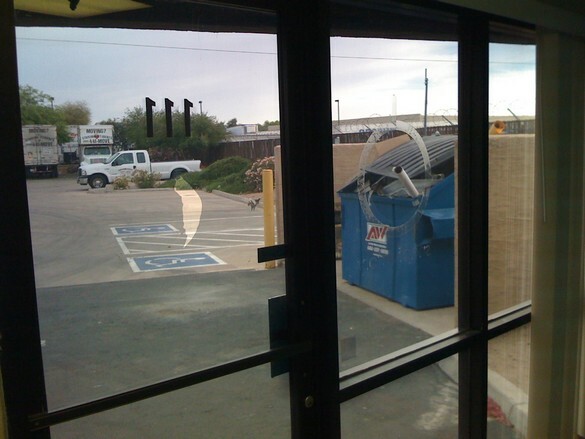 A last look at the studio in Tempe. I shot this with my iPhone just before walking out the door. 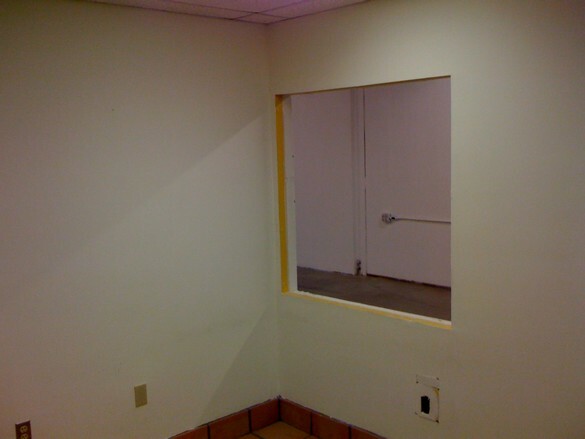 This hole is where we built our makeup counter. We took that with us. One of the things I won’t miss at all; the dumpster right outside our front door. And as a tribute to the old space here’s a video from 2006. I think it shows everything in the studio except the bathroom. You may also recognize Lilli and Amanda from previous posts. The construction crew started work on our new studio today. The front area is being converted into our new classroom space. 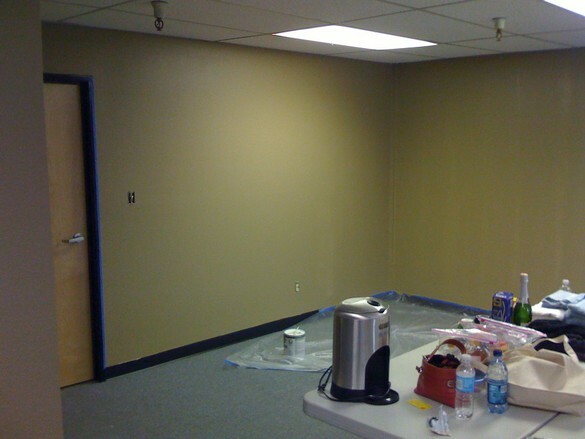 This requires the crew to remove a few walls, fix up the ceiling, and put down new carpet. We’re also having a new door installed in the bathroom so it can be accessed from the classroom or the studio. This is no small task since it requires all of the plumbing to be updated in the wall where our door is going in. 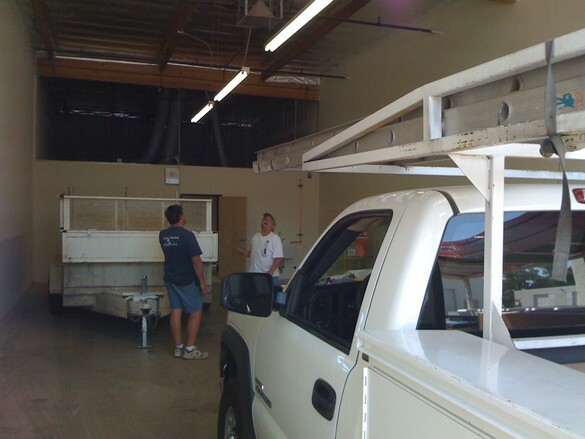 We’re also having a 4–ton A/C unit installed in the studio so our clients and models stay cool during the hot summer months here in Arizona. Of course we need the A/C unit to be out of the way so that means the existing lighting has to be moved so the ducts can be installed in the correct locations and kept to a minimum height of 12 feet. I snapped a few photos with my iPhone while I was meeting with the contractor today. We expect everything to be finished in about 10 days. 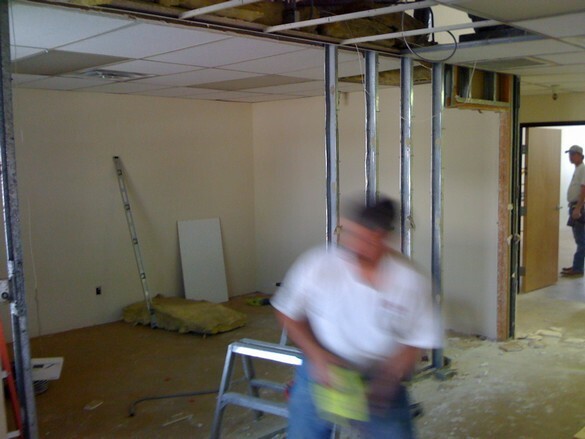 Workers begin tearing out the walls. Don, the supervisor, instructs the air conditioning company about our needs. Workers trying to figure out how they are going to install our new bathroom door. The problem is all of the plumbing in the wall that attaches to the sink and hot water heater (hidden from view). Progress on the wall removal. This guy was re-routing all of the electrical that used to be in the wall. 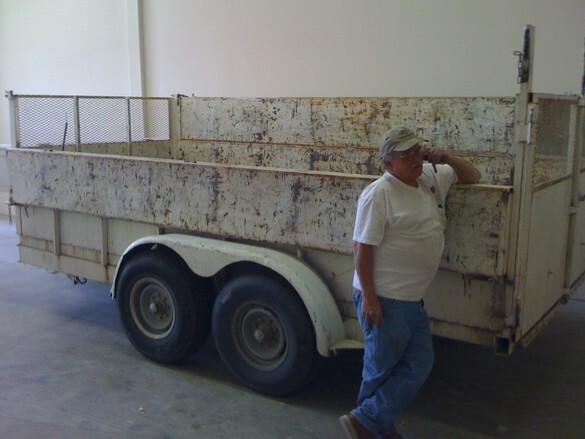 This trailer was inside the studio and was used to store all of the material they were ripping out of the front room. Although it looks small the studio is actually 60 feet front to back. It’s going to be nice having a bit more space. We spent some time at the bank today signing our lease and having everything notarized. All of the paperwork has been filed, our deposits have been paid, and we are officially moving! Special thanks to Matt Fredrick of Lee & Associates for all his hard work. We had him running all over Phoenix looking for a terrific location. 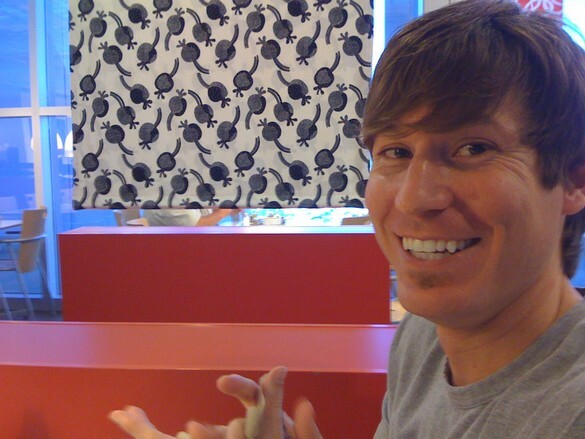 If you ever need some business property in the Phoenix metro area give Matt a call: 602–912–3532. We’re Moving! …and teaching Photoshop! I can finally spill the beans on something we’ve been working on for quite some time now. After searching high and low we’ve finally found a new location for our studio. We are very excited about the move. 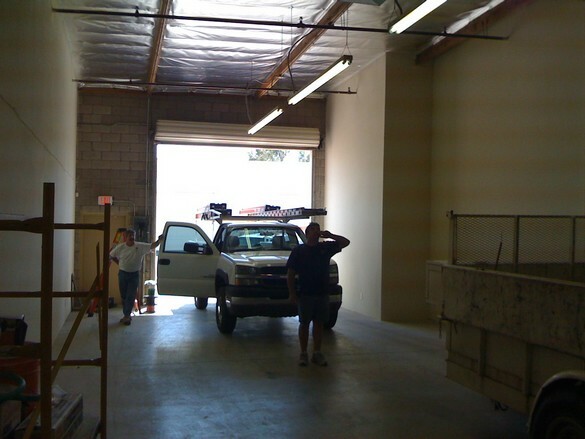 We’ll be in our new location May 1st, just in time for our May 17th Studio Lighting class. The new studio is about 400 square feet larger than our current space – and all of that new space is going to be dedicated to our workshops. This means that we’ll have a permanent classroom space! 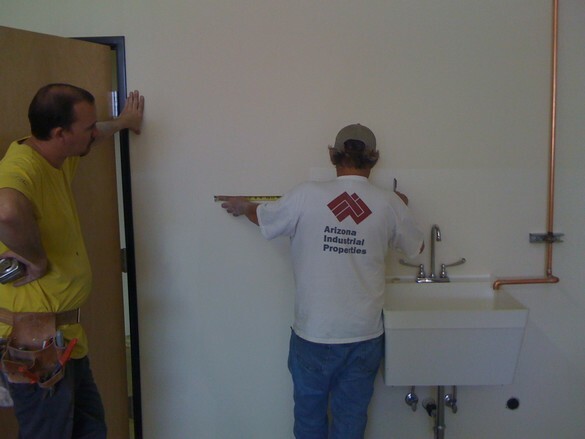 The new classroom is being custom built for us. As soon as construction begins I’ll start posting photos. 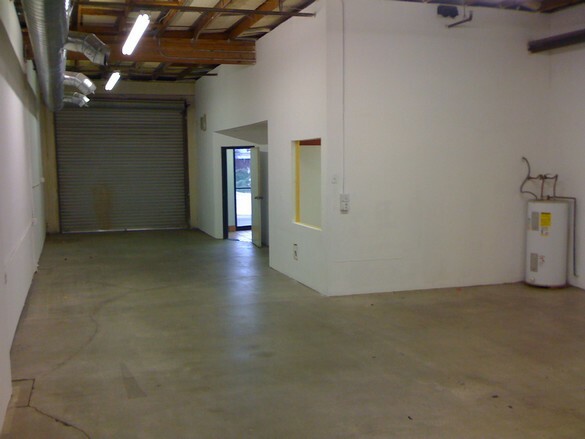 With the permanent space I’ll be able to offer more workshops. The first thing we’re adding are classes for post production. That means Lightroom and Photoshop. As things come together I’ll be making announcements about the new Photoshop classes. I’m also going to be offering two free workshops. Neither workshop has a name (please leave your suggestion in the comments section) but they are going to be terrific. The first workshop will be focused on using photography as a means for social change. I’ll be discussing ways you can use your skills at your local non-profit organization, church, animal shelter, border crossing, or war zone. The second workshop isn’t really a workshop at all. It’s a gathering of people that meet to talk about their current photography and learn from each other. It will be limited to 10 people and won’t be a teacher/student type of environment. I will be the facilitator but not necessarily the teacher. Applicants will have to submit a portfolio and artistic statement to be considered. The group will meet weekly for about 12 weeks. Look for more details soon. The new studio is located a few miles west of our current location. It’s on 40th street just north of Southern Ave. As soon as we have the lease signed and sealed we’ll be publishing the exact address. The move keeps us close to the airport for folk flying in for our workshops but moves us out of the flight path so we don’t have to listen to jets flying over all the time. You can see the studio from the street so people will have a much easier time finding us, and the floors are brand new and beautiful! Suggestions for the names of my new free workshops. Any special requests you have for the Photoshop classes. Word of mouth – please tell your friends about us. Our new location is twice as expensive and we really need to stay busy! I’ve been looking for an inexpensive solution for portable power so I could take my studio strobes on locations with no power. I looked into buying a gas generator but decided against it because they are just too big and bulky. 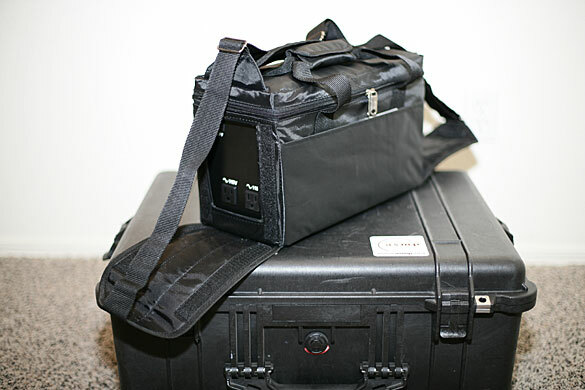 Profoto recently announced the AcuteB 600R which is a very nice pack (currently shipping with free head). This is a pack that I was seriously considering. 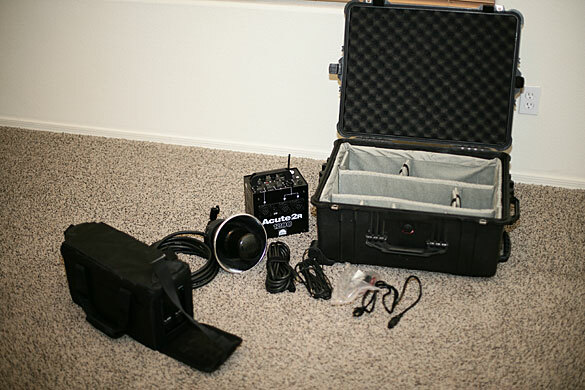 It’s a relatively inexpensive system that delivers high quality output. The type of location shooting I want to do requires shorter flash durations and a bit more power than the Acute is able to deliver. I also want to the option to use more than one head if needed. The Pro7b 1200 is really the pack that meets those requirements but it’s beyond our immediate budget. We have several things on our list to purchase this year and at the top of the list is a new Profoto D4 pack. A Pro7b just isn’t in the cards for us anytime soon. But, darn it, I want battery power now! I’m fortunate to have a great relationship with StudioLighting.net and a couple of months ago Bill Crawford reminded me of the LightSource Podcast featuring David Bean. David talked about a very cool battery pack called the Tronix Explorer. It’s a portable battery pack that’s capable of powering a 1200ws generator for a few hundred flashes. After reading David’s review of the Tronix Explorer I decided to give it a shot. The Tronix Explorer, a nifty case and shipping was just over $300. It was less than a week from time of purchase till it showed up on my doorstep. That’s pretty incredible from a company that’s located in the Philippines. I’ve had to wait longer for shipments from B&H Photo. Power Tip: If you’re in the Western US always go to Canoga Camera before B&H. They have stellar prices and service and the shipping costs and times are always better than B&H. Customers outside of California don’t even pay sales tax! 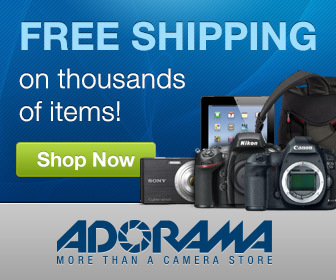 That’s big time savings if you’re picking up a new 1Ds Mark III or Profoto D4. 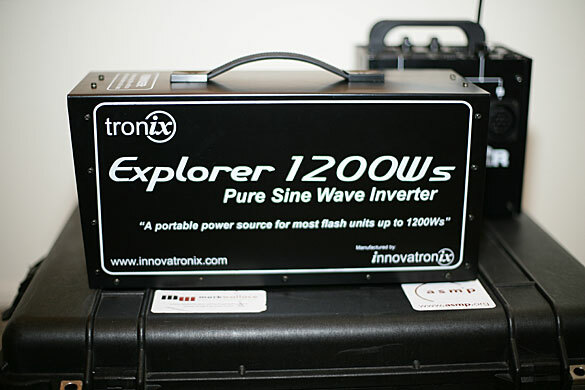 The Tronix Explorer showed up a couple of days ago and I’ve only had a few minutes to play with it. You’ll have to wait for the full blown review (which will probably be a new YouTube video). I did play with it enough to realize it’s heavy. It’s about 20 pounds, not something I want to be lugging around. My first order of business was to put it on wheels. I recently watched a very cool video that Chase Jarvis put together (click here to download the video). He has a very cool setup for his Pro7B system (yes, I’m jealous). 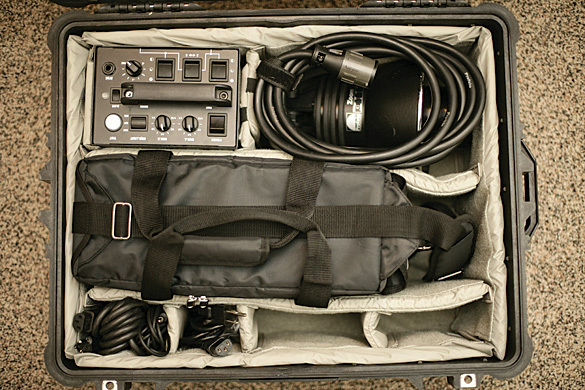 His entire Pro7B system is contained in a single LowePro bag – on wheels – Bingo! Good idea Jarvis. This is why I constantly ask myself, “What would Jarvis do?”. The dude has good ideas. I happened to have a Pelican 1610 that we weren’t putting to good use. After moving some things around I created a one head setup on wheels. I believe there’s still enough room in the case for my ring flash so I’ll probably throw that in for good measure next time. The 1610 hold an Acute2 1200R, D4 head, Tronix Explorer, power cables, sync cable, and a cigarette lighter adapter for charging on the go. You can see I still have empty space for a ring flash, speed ring and other things as needed. The case is a bit too small to fit an umbrella or small softbox but I can always throw those in a different bag pretty easily. Here are the contents out of the box. The Tronix bag has some nifty flaps that fold down for easy access to the power outlets. Here’s a shot of the Tronix Explorer without it’s protective case. The Profoto Acute 2 1200r is in the background. The Tronix case is so well designed that I don’t see a need to ever take it out of it’s bag. I just did this to show you what the unit looks like without it. Here’s a shot of the Tronix with it’s clothes on. The bag has reinforced edges and is very rugged. One of the complaints about the Tronix was the wimpy handle that’s built on the top. I guess they created this bag to fix that and give it an added bit of protection on the road. Here’s a shot of the 1610 (on the right) next to our video case (1510). The entire system is very compact and will easily fit in the back of an Xterra. 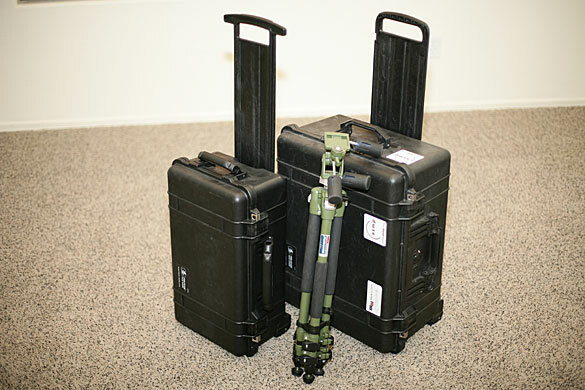 The Pelican cases are also ready to fly if you need to take it out of town. The only other part of the system that you don’t see is a single Matthews C-stand and sandbag. If you have an assistant you can get by without a light stand but I like to have one along if possible. I’ll be taking this out for a test shoot as soon as possible. I’ll make sure to tape the experience and post it on YouTube. Studio Lighting 101 + iPhone = fun. We had a great time in our Studio Lighting 101 workshop yesterday. We had a great group of students. During the workshop I took some snapshots using my iPhone just for fun. Here’s a low resolution look at some of the fun. The first lighting setup of the day. This was a basic 3 light setup with a two lights added to give the background a bit more light. We mixed our Profoto equipment (foreground) with our student’s equipment (background lights) to illustrate how to mix and match lights. Our model, Amanda JoLynn, sits patiently while we discuss the different options. Another shot of Amanda, this time from the reverse angle. Students Johanna and Praveen makes some adjustments to the lights for one of the setups. Students shooting Amanda. Praveen, Johanna, Dave and Hartono are shown. I think those are Angie’s hands just to the right. The white blob is our studio dog Luka. Diane gives some pointers to the students. Left to right; Angie, Stacy, Dave, Praveen and Diane. Angie saying, “WOW! I love the ring flash! !” Amanda smiles in agreement (every model loves the ring flash) and Johanna agrees in the background. Dave getting in on the ring flash fun. It’s just too good to pass up! Dave, Praveen, Diane and Hartono. Yesterday was a lot of fun. Thanks to such a great group of students. We’ll be adding more workshops in 2008. We’re working on the schedule and will be posting it soon. I hope to see a lot of new faces in the coming new year.